With some delight I heard on this mornings 7am BBC4 news that 1 in 7 people in the USA and the UK believe the US Government had more involvement in the 9/11 terror attacks. Between 18 to 24 year old’s the figure rises to 1 in 4. On the 8am news broadcast this item had disappeared. 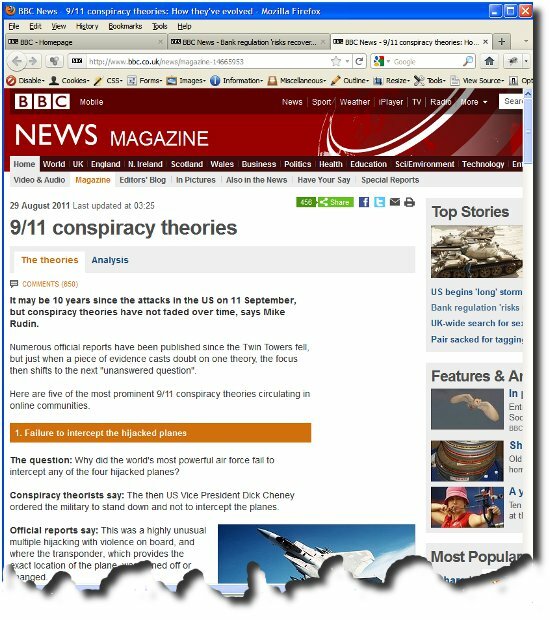 While on the ‘net later on I had a look at their home page and the item was buried down on the right hand side under the heading The Evolution of the 9/11 Conspiracy Theories. This page is what was behind the news item. I have to say I am troubled by the whole thing. The problem for me is I have actually taken the time to look at what the Conspirators put forward as their case. Next I have looked at what the mainstream media put forward as the Conspirators case. This is nub of the problem. They never do put the case forward as the conspiracy presents it, and, it always degenerates in their reporting in to a rapid fire of mixed up views and questions which serves to debase the case and suggest that all conspirators are lunatics. A further trouble is the subject is broad and in depth and therefore difficult to put over in one single post. Lets try a different perspective. Had you lived in Germany in 1939 and people said there were concentration death camps, would you have believed them?? Had certain groups of the population been rounded up and sent to worker camps, would you have accepted that was what was going on? Would you proclaim someone would be trying to point this out to you if it were really going on? Surely if someone tried to point them out to you, you’d dismiss them as a mad Conspiracy Theorist right? Is someone trying to tell you something? Would you expect to end up with an informed opinion on those things by letting other people, like news reporters, do the reporting for you and present the evidence on tv [or as the 1940’s showed, the Cinema screen]? Actually isn’t that where you’d be shown that nothing was further from the truth, than the truth? The 9/11 incident is important because not only did around 2,900 people die in the towers themselves, but it was the spark to instigate two wars, Iraq and Afghanistan. In these two conflicts millions of people have since died or been blown up and injured. The issue goes far beyond 9/11. Its as well to remember that most people when asked how many towers fell down on 9/11 answer two. The correct answer is of course three. Two planes crashed into two towers and three towers fell down. In the confused state of world affairs many things happened quickly, and those parts have their own histories and these too are worth investigation, but they are outside the scope here. How could you possibly hope to have an informed opinion on Lord of the Rings or Star Wars if you’ve never taken the time to watch them? 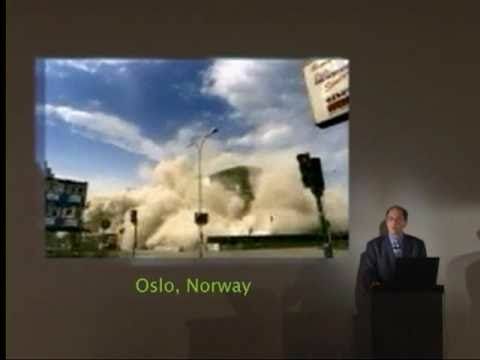 I would urge you to look at what the 9/11 conspiracy files hold first hand. All it takes is an hour and fifty one minutes of your time to watch their video. That’s it. You will see for yourself first hand if they are lunatics without a life or professional people with educational degree’s in Architecture and Engineering, of Physics Phd or people who work in the aviation industry, Police or Fire service or even the BBC. You will see they are keen to answer questions and as likely the very question or statements that you hold as to why its all a load of crap, they will probably address too – but only if you’ll give them the chance by watching their film can you see what the Conspiracy Theory is about.